About 750 native trees, shrubs and grasses were planted near the Otaki River estuary on Arbor Day by Friends of the Otaki River, (FOTOR) 20 plus children from Otaki School and some special guests. Pupils from Otaki School had assisted with potting the seedlings last year and were there to see how big their seedlings had grown and to plant them out in the newest part of the estuary environmental reserve. 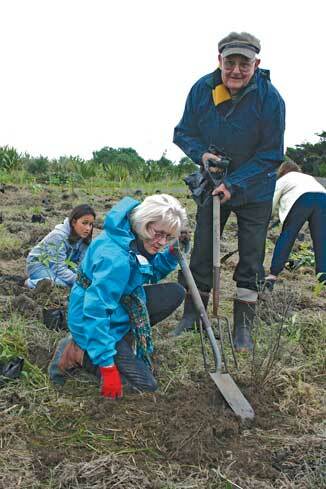 Keen environmentalists, Peter and Diana Standen were among those at the Arbor Day planting. They were busy helping with the newest area of estuary restoration. The $5000 funding, from the Phillipp Foundation, covered the costs of the potting mix and growing bags for the plants. A new plaque has been installed at the site, the western end of the Highway to the Sea walking and cycle way. The area is identified at the Otaki School Planting, Phillipp Foundation. Trustees, Irene and Ray Mackle were present to see the new area being planted. ‘I hope this area you will remember as the area you planted, when you visit in years to come,’ Mrs Mackle said to the children. FOTOR president, Max Lutz was very pleased with the mornings work and the effort the children had made in planting out the trees and shrubs they had potted up last year. Former Otaki School pupil, Barry Cole, (he began there in 1941), was also helping his old school with their planting efforts. After all the plants were securely in the ground, morning tea was provided for everyone, hot chocolate for the children and tea or coffee for the adults, with biscuits for everyone. Four Generations: Long-time members and workers of the Friends of the Otaki River, Eric and Vanessa Matthews, back left, were joined at the Arbor Day planting by daughter and son-in-law, Tania and Pat Hakaraia, granddaughter, Mahinarangi Hakaraia, a former pupil and now staff member at Otaki School, and great-grandchildren and current pupils, Kaea aged nine and six year old Te Haitaewa Hakaraia-Hosking.